Welcome to our 10th episode! 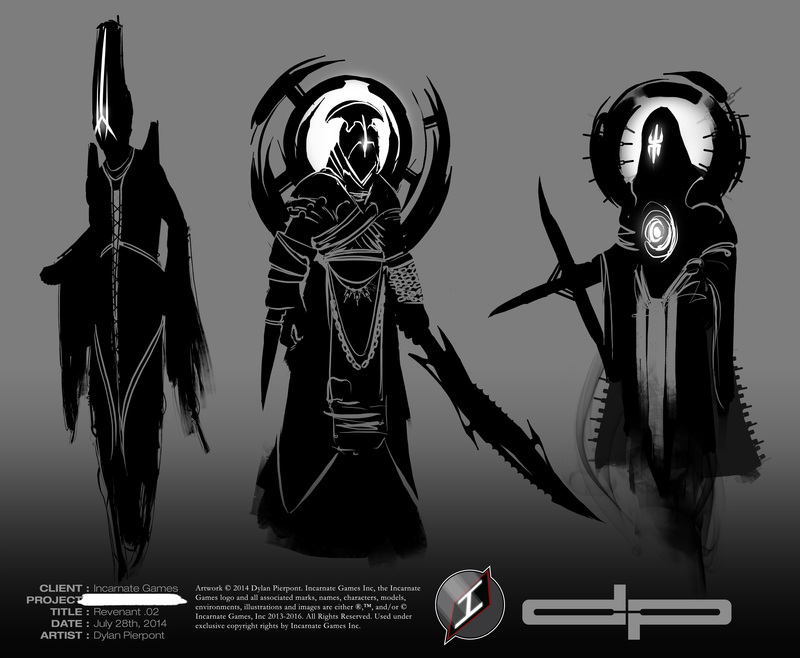 Things start getting serious as we see a new set of Revenant concepts created by Dylan Pierpont. If you are just joining us, or did not get to see the Revenant character descriptions, please click here to view Episode 5 – Revenant Concepts. “For the second set of Revenant I also like 1 and 3. To be honest I would love to see the combination of the two, with #1’s head and with #3’s halo and body/garments. I think I have to admit that the Revenant might be more frightening than I originally was expecting, but this is a good thing. I think you have convinced me that they should not be as heavily armored as well, it makes more sense. For the other two, any concepts you come up with utilizing combinations or even new concepts with partial combinations, its up to you. I think I’d like to hear your thoughts about this one before you conceive this particular one. I’m convinced that the spear with the cross-blade-for-an-arm combination is a winner though. It is a little over the top given the dual weapons. I think both are unique enough to stand on their own, so maybe we do 2 versions with the Revenant holding each weapon individually to see what we like best. But we still want to go with both blades, then so be it. I’m not entirely opposed. As for the head, in the original sillo posted on July 29th, you’ll notice his entire figure was based on the idea of ‘length’. Everything from his head, to his torso, to the lines in his robes and the robes themselves were elongated to fit that motif. In your revised example however, he now has the sigil ring behind his face, which the head clearly breaks the frame of because of it’s height. In previous versions you’ll notice the heads were kept deliberately standard size so the sigil ring could frame the face entirely. Therefore I would agree that in the revised version, the head is starting to feel “over the top” whereas before it was part of his character aesthetic. 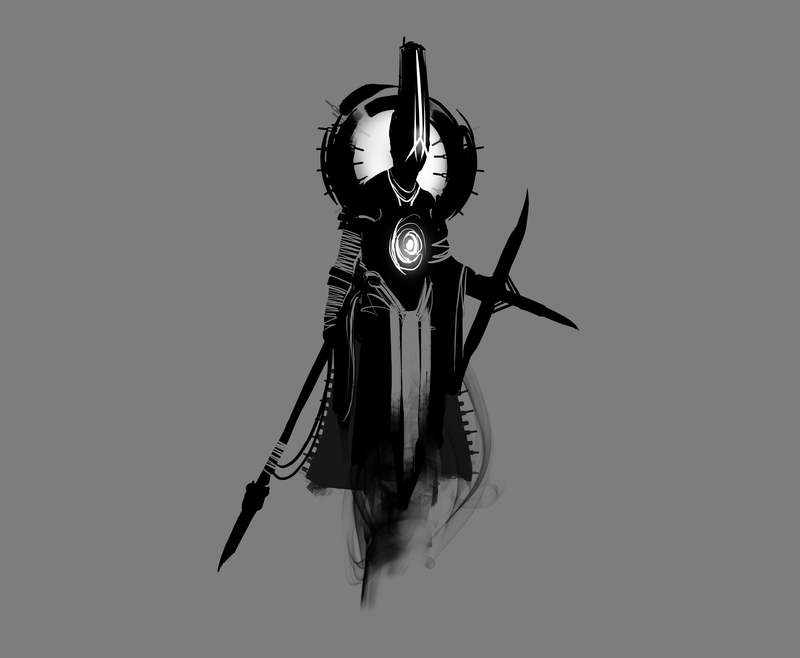 Possible solutions would be to reduce the sigil’s size so it only encompasses the head and nothing more, attach it to the head as additional decoration, or remove it entirely. Stay tuned for EPISODE # 011: Kynazarr Rough which will be posted soon! © 2016 Incarnate Games Inc. All rights Reserved. The Incarnate Games logo and all associated marks, names, characters, story content, models, environments, illustrations and images are either ®,™, and/or © Incarnate Games, Inc 2013-2016. All Rights Reserved.